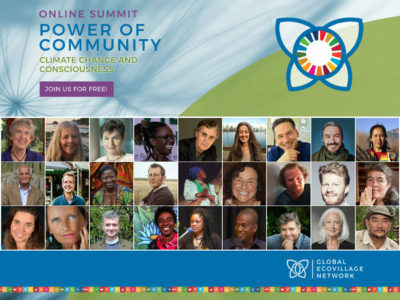 Networking between GEN, ecovillages and academic researchers requires several different forums: discussion workshops at GEN conferences on what ecovillages want from research and how they deal with research requests, and lectures and panels at academic conferences of different disciplines. We are considering an Advisory Board for GEN Research including established professors from the academic world with the purpose of ensuring appropriate research on ecovillages (refer to Setting Standards, Values, & Goals, below). Integration & Dissemination to acknowledge and bring into awareness how much research has already been published on ecovillages. This is the base for further research, instead of reinventing the wheel, which still happens. We are exploring appropriate options using existing platforms in the academic world like researchgate.net and academica.edu, rather than creating a GEN-specific database (as this would be costly, time consuming, and most likely less effective in reaching researchers than these existing platforms). The main aim is to integrate links to, and sources of existing ecovillage research in one place, and disseminate this information widely. Setting Standards, Values & Goals refers to a ‘code of conduct’ (or code of research practice) that will set guidelines for researchers on how to approach ecovillages with research requests, how to conduct this research respectfully, and how to include means of compensation for resources and staff time that ecovillages are requested to extend in support of research projects. In the long-term we hope that the GEN Research Working Group and its Advisory Board can be involved in setting goals for future research. Primarily, we want to raise the awareness amongst researchers to give something back to the ecovillages. Additionally, we will develop a code of conduct and recommendations on ecovillage research. In many cases, researchers from universities work for their personal accreditation or are paid, while expecting voluntary time investment by ecovillagers. In respect to this requested contribution of time, it is quite fair that researchers take care of ‘giving something back’. This can be voluntary work in the ecovillage or assistance with larger projects, a financial contribution, and/or inclusion of the ecovillage as a partner in the research proposal and project funding. Find reviewers on ecovillage articles for journals, etc. You can download our first, second and third newsletters as a pdf by clicking these links. Other projects like an “Ecovillage Design Research” capacity-building program and handbook are planned. If you are interested to become more active, please let us know how you wish to be involved. The structure of GEN Research has two main subgroups: One for information exchange and the other for getting more involved. As a medium of communication the focalizer hosts a listserve with more than 100 people (at present). It is used for exchange between researchers in the area of ecovillages, communities and neighboring fields. A GEN research newsletter is posted. All members of the list are invited to post their urgent news and send their information to the foculizer who compiles a newsletter. If you are interested to join this list, please apply here. If you want to get more involved: We are a working group of about eight people which organizes around GEN Research, with one main focalizer, and a separate internal email listserve.